Do you know what your car is actually costing you each year? What about over an investing lifetime? 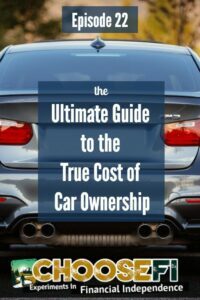 In this episode of the ChooseFI Radio Podcast we cover the True Cost of Car Ownership and you'll be absolutely amazed at the numbers. This example is too conservative so a FI person would actually save even more money! At the end of the 45 year period, Person A’s savings compounded to be worth $742,000 versus Person B who was constantly paying $300 per month. Takeaways: Don’t buy new cars and continue to drive your car as long as possible with no car payment! Calculation of maintenance, insurance, taxes, inspections, etc. I made a compound interest problem out of this episode, and used it in my Algebra class today. Then we discussed the math behind why buying a brand new car is not a smart decision. So many people buy a new car right out of college, but investing the amount of a monthly car payment for 5 years turns into a staggering number when compounded over a 30 year working career (even after you stop after 5 years). That new car is cool now, but is it worth not having $200K later? Thanks for the information guys! Teenagers love the idea of FI, but no one teaches it to them. Great content! I love the real life, actual-numbers example to help put this all in context. I am absolutely on the same page about minimizing transportation costs where at all possible. I currently live in a more expensive metro area, and not having a car has been a huge money saver. Additionally, I would go so far as to say that the annual opportunity cost you presented is on the lower/conservative side. For example, buying the 5-year used car at $15k and investing the $15k difference between that and the new car means I would have $32k at the end of 10 years (after compounding at 8% per year), or about $3.2k per year in “true” opportunity cost – that number is even higher with the 10-year old car ($5.4k in annual opportunity cost by buying the new car). Again, loving all the content you both are putting out, and looking forward to all the great content to come. While it may be harder to present with actual numbers, please please continue to do so – it really drives the point across better. Thank you! Lifestyle creep is a real and dangerous thing, especially when it comes to the vehicles people drive. Its rare that you see someone “move down” in car, and when they do you can tell there has been an ego hit. Johnathan, I totally agree with your statement about being able to own nicer things with a positive TCO when you buy well below market value. I have actually done this with boats for the last 5 years or so with a simple 800# and a website. What I do specifically is very similar to what many of the buyers/wholesalers over at biggerpockets do with homes. I browse craigslist, send out some direct mail, leave flyers at marinas, and put “bandit signs” around at high traffic areas around a a specific lake I like to hang out on…all to drive traffic to a website (boatcashusa.com) or a lead gen phone number (844-boatcash). Typically, I know the exact year, make, and model that I want to buy and I know the ACV (actual cash value) of the boat and I will make offers well below that number. I think this could be easly replicated with popular cars, and I know several guys that do that quite a bit. I hope that clears it up. I’ve probably spent a total of $300 in marketing. I’ve purchased 5 total in 5 years and have a positive (profitable) total cost of ownership including storage, maintennce, insurnace, fuel, winterization, etc. What am I screwing up on insurance for the cars? I just dropped it by 600/year by switching from Allstate to Liberty Mutual. It’s still $1,762/year (147/month). That’s for full coverage on 2 cars – one is 6 years old, the other is 17 years old. The Comprehensive and Collision coverage (with 500 deductibles) is $501/year ($42/month) of that total. So – I’m $147/month for full coverage and $105/month for just liability. Your numbers are $100/$50 – so it appears I’m overpaying by 50%. I know I can adjust them in the spreadsheet – but there has to be more than this. I don’t think car insurance in Florida is 50% more than Virginia. Now – I have great coverage – but as I come close to FI, I think I need that insurance – right? 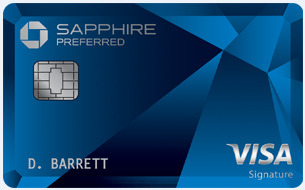 I don’t have towing (I have a Chase Sapphire Reserve card thanks to Brad, so that covers that) and no Identity Fraud (get that from work), I do have towing – but that is $56/year total for both cars. I’m almost 50 (wife 4 years younger) with perfect driving records. On a different thought – I can find common ground for you guys with driving a nice car (cars) while still being frugal. I have a BMW Z3 and a Lexus CT200h. The BMW is in awesome shape because I take great care of it – it’s almost 18 years old now, and still turns heads for less than a slightly newer Civic. The Lexus CT200h is basically a Prius, it was only a couple hundred more than a similar Prius – same 42MPG, looks better in my estimation and handles better. Also, depreciation is on a slower curve, but pretty much irrelevant for a guy that’s going to drive it into the ground. I’d check the actual rates in FL vs VA instead of making any assumptions on that front. When you’re FI, you don’t need #2 for your car. When I mentioned that I have “great insurance” – I wasn’t clear. I meant that I have lots of liability insurance – because, as I get closer to FI, I have a higher net worth, and need more coverage so I don’t get cleaned out. Your comments on “low probability, high cost events” did resonate with me. I guess my frustration is similar to years ago, before I understood 25X/4% rule. I used to wonder “how much do you need for retirement – what’s the number?” Now I know. 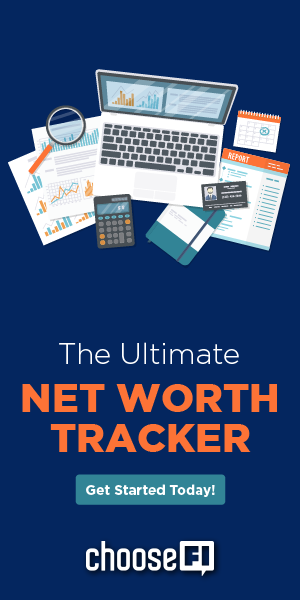 I’m looking for a similar epiphany with insurance – “how much insurance do I need if my net worth is X, my cars are worth Y and I’m paying Z. That’s a calculator I could get my head around. Insurance agents are worthless – they are paid to have me have super coverage I’ll never use. Same with Insurance companies and lawyers. I wish there was a “Insurance consultant” with a fiduciary responsibility like we sort of have in financial advisors. Of course, I don’t trust them either 🙂 Thanks! Hi guys, this great episode inspired me to think about my cost of non-car ownership, I hope you don’t mind! These figures are really conservative when you figure the average person needs to earn more than $35K in wages before having $30K in gross post-tax dollars to actually buy a $30K car. Yet another reason to avoid this much vehicle expense. I am wondering if you guys could have a podcast with MMM and have one of the topics be a discussion of whether bicycle usage is a pillar of FI or not. That would be pretty funny to hear. Glad to hear a podcast from guys in Richmond, VA. I am in Maryland and half of my family is from Richmond, VA. Everybody always seems to be from Colorado in this community! I’ve always been a little confused at depreciation. I’m not an accountant or anything, but I don’t feel it is too technical, I guess I just disagree with the premise. Especially the idea that this is ‘real’ dollars. The money you paid for the car is real, and it is already gone, how am I losing it again? Maybe it is my personal view on vehicles. I don’t really see them as investments, which I know most of y’all don’t either, and I don’t see them as something to resale, because I plan on running them into the ground. In that case, why would I count depreciation? I look a car as something I pay for as a means for travel, something that offers utility. Like I said, maybe I just don’t have a good understanding of deprecation. Would love to get more thought from y’all about this. Also, if it were possible to test, I bet you could blindfold someone have them test drive a BMW 3 and a Mazda 3, and they probably couldn’t tell you which was which from driving. I listened to this podcast today and while I enjoyed what you did, I do think there is another way of looking at it. The comparison you make is somewhat biased against the new car buyer because he only holds the car for 10 years. But many new car buyers plan to hold their car for much longer, which spreads the initial high cost over a longer period. Keeping that in mind, I would assume each of the buyers is going to buy a car and hold it for it’s whole useful life rather than each holding it for an equal period of time. I would assume the useful life of each car is 200K miles and that each driver puts 10K miles on his car each year to make an apples to apples comparison. 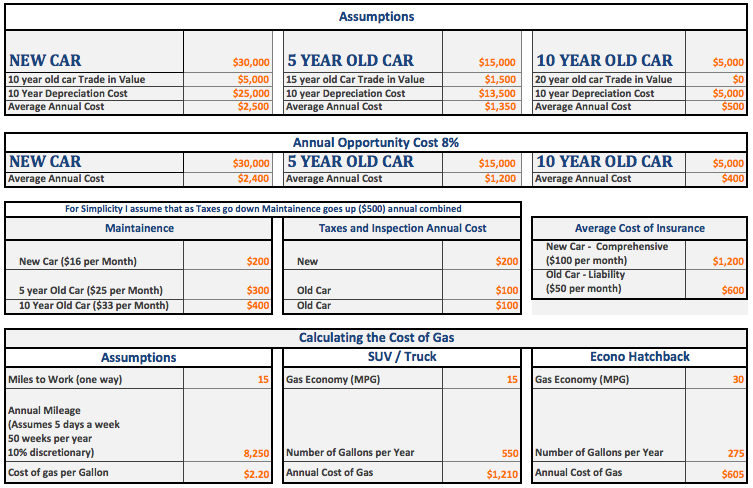 In Scenario A, a person buys the car new, puts 10K miles on it and uses it for 20 years until it’s worth nothing. He then repeats the scenario and buys a second new car that lasts for 20 years. And then does it a third time. So over 60 years, he buys 3 cars. In Scenario B, a person buys a 5-year old car with 50K miles and uses it for 15 years until it’s worth nothing. He then buys a second 5-year old car, holds it for 15 years and repeats it two more times. In a 60-year period, this buyer has purchased 4 cars. In Scenario C, the buyer buys a 10-year old car with 100K miles, holds it for 10 years until it’s worth nothing. He repeats this 5 more times, so that over a 60-year period, he has bought 6 cars. Using your prices, the average annual cost of the new car in Scenario A will be $1500. The average annual cost of the car in Scenario B will be $1000, and the average annual cost of the car in Scenario C will be $500. While the annual cost is still the cheapest for Scenario 3, the average yearly costs are much closer to each other. Just another way of looking at it, as I think some buyers, particularly frugal ones, would be more likely to hold a new or newer car for its whole useful life. Love your podcasts! I listen to them when I go walking everyday. They keep me motivated in more ways than one! Here’s where the system blew up for my family. My husband was driving a 2004 Acura TLX and I was driving a 2005 Honda CRV (both bought used and paid off). Last year my husband was in a wreck (100% the other driver’s fault) and that car was totaled. This year a tree fell on my car and it was totaled. So sometimes your plan of driving a car for 10 – 15 years doesn’t work! Thanks for putting all of these podcasts together! I’ve been running through them from episode 1, and had something to add here that’s easy to use. Edmunds.com let’s you select a car within the last 5-6 years and automatically does the numbers for you! They have slightly different assumptions of course but it makes it easy for people to compare and contrast the option between a new BMW M3 and a 2012 Honda Accord. I am saving $3,000 by giving up my car and returning to my original love, my bicycle. If you need a car, you need a car. But I think that people with luxury cars, most of them, are just insecure of themselves. I also think that people who gas guzzlers, are saying F. U. to the environment and anyone who cares about the environment.